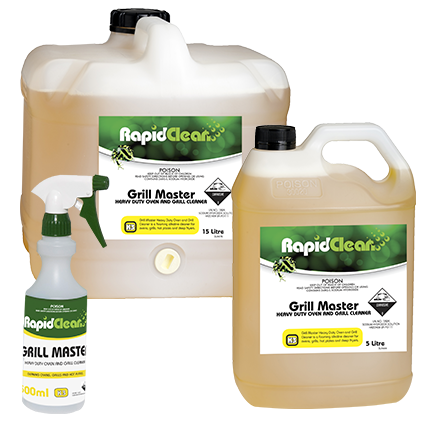 Grill Master Heavy Duty Oven & Grill Cleaner is a caustic base foaming alkaline cleaner for ovens, grills, hot plates and deep fryers. It can also be used to clean stainless steel canopies in kitchen environments. Available in 5 Litre or 15 Litre or a screen printed spray bottle (Bottle Only). We offer special prices for major accounts. Contact us for more information. Available in 5 Litre or 15 Litre. Copyright (C) 2017 RapidClean Coffs. All Rights Reserved.